The first annual Chicago Art Book Fair (CABF) was held from November 16th through November 19th, 2017, at the Chicago Athletic Association hotel in downtown Chicago. Featuring over 150 independent publishers, CABF made Chicago a global center for print and publishing. In presenting emerging and established artists, the fair championed the city’s rich history in print and publishing, while aiming to inspire a new generation of makers. In partnership with the Chicago Athletic Association hotel, Johalla Projects, and a number of local arts venues, CABF presented a unique opportunity for the public to support and engage with working artists. Extensive programs affiliated with the fair took place throughout the city, connecting Chicago’s existing art communities while also fostering new opportunities for public engagement. 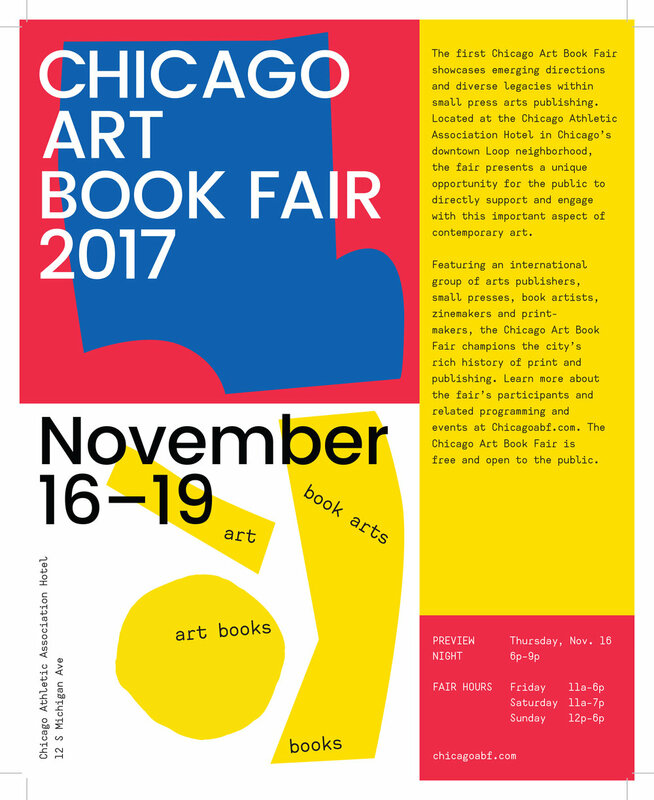 For more information about the Chicago Art Book Fair and upcoming announcements on its programming, visit cabf.no-coast.org.